Well one thing led to another and we got married the other day. I love planes and flying so I had to incorporate some of this into our wedding day. 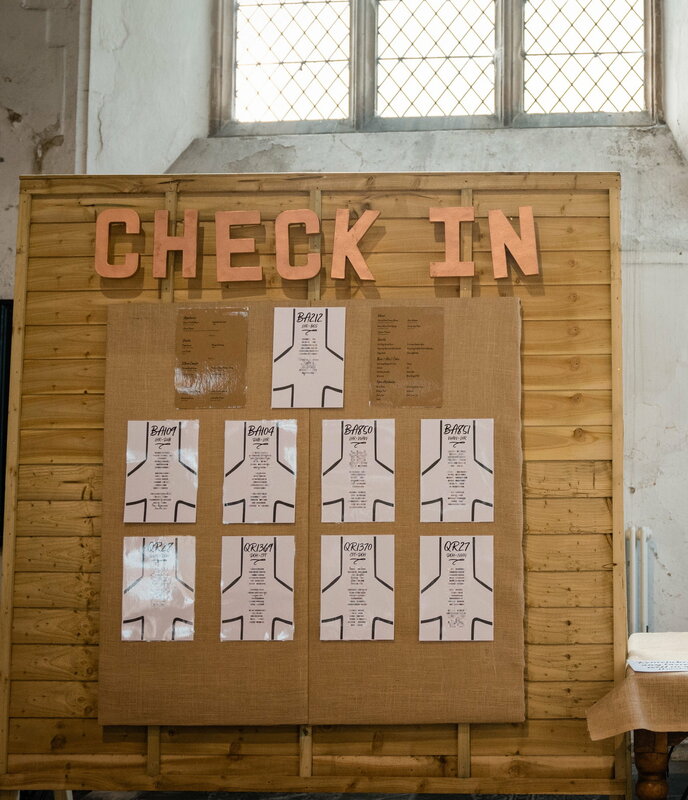 For each of our tables at reception we decided to name them after a flight number that we had both taken together, and for seating plan I made a “Check-In” board. Then instead of name places we decided to re-create little boarding passes. I made an online RSVP system which took a booking reference (random 6 character code) which was assigned to each couple or family, much like a flight booking reference. This was individually printed on each boarding pass, then instead of a barcode I put on a QR code just because its more mobile friendly. If you scanned the QR code it would take you to the online system where you could see your filled out RSVP with food preferences etc. Each boarding pass had the flight details of each table along with the travel class we flew in on that flight. Your seat was made up of where you were sat at the table, and I put on your main food choice. I perforated the side part for easy tare off like on a real boarding pass. Finally for the sequence number I decided to use the date of when everyone sent in their RSVP. All small details which I’m sure none of my guests realised but it was good fun putting together. 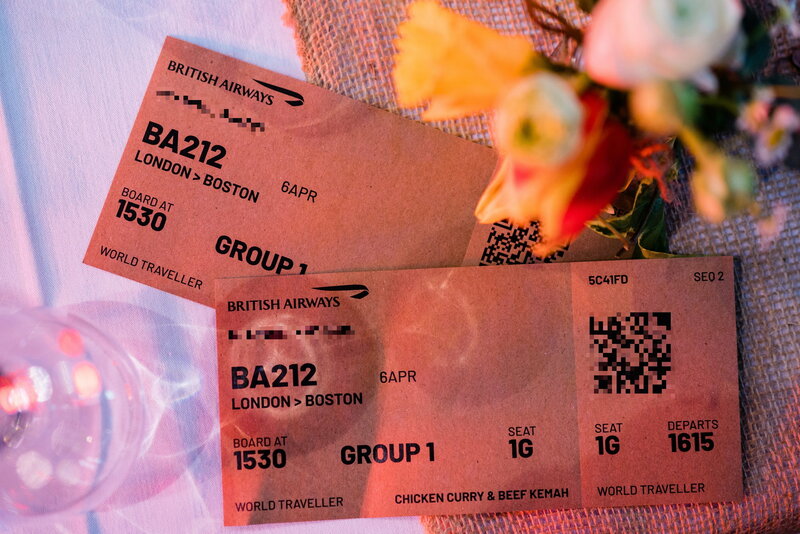 We had a curry buffet for the main meal so everyone was called up the buffet by the group number on their boarding pass. Thought you guys might appreciate some of the finer details. KARFA, AlbaGuBrath, Flexible preferences and 73 others like this. What a brilliant idea! Congratulations to you both. What a fun and novel idea. Congratulations to both. You should have invited me. I'd have barged my way to the front of the buffet shouting "Bronze, Bronze!!!" nancypants, Scandinavian traveler, PrimaVista and 27 others like this. Wow congratulations!! What a truly fun and unique idea - I am sure it must have been fun to plan! What a great idea - so original. Congratulations! One of the best posts I've read here on FT. Bravo and Congrats ! wanderingjock, KeaneJohn and snaxmuppet like this. A very creative and appropriate wedding theme! Congratulations! Really great - many congratulations for the big day, and for finding such a creative way to incorporate the geekery we all enjoy indulging in here! Only on FT!!!! Congrats - sounds like a great day. I hope there was no protein in the sauce, just like in the Galleries lounge. RG1X and cosmo74 like this. I love this. As someone who had a heavy travel theme to their wedding, I really appreciate this. I wish I had the imagination and time to come up with something so clever and intricately detailed! Hats off to you. Congratulations and all the best for the future. All times are GMT -6. The time now is 8:41 pm.